After six years of absence from IndyCar, Helio Castroneves showed what the racing series was missing by winning the IZOD IndyCar Series season-opening Grand Prix of St. Petersburg with his Chevrolet engine-equipped race car. 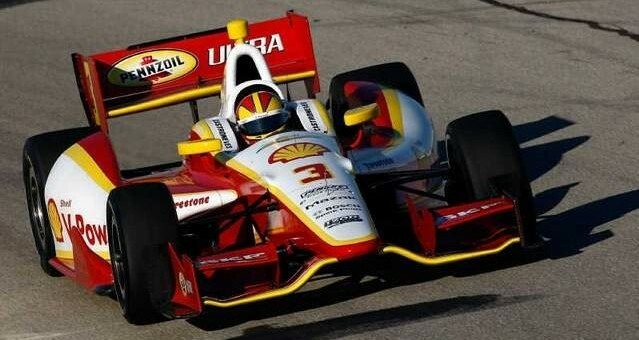 Castroneves led 28 laps en route to his third career win at the 1.8 mile street course. It wasn’t just Castroneves, either. But he was first of the six Team Chevy drivers in the top eight, with Ryan Hunter-Reay (third), James Hinchcliffe (fourth), Ryan Briscoe (fifth), pole-sitter Will Power (seventh) and E.J. Viso (eighth) utilizing the Chevy V6. The Chevy IndyCar engine is a twin-turbocharged, direct-injected V-6 and is currently supplied to both Penske Racing and Andretti Autosport. It is a 2.4 L V6 turbocharged engine, tuned to produce a range of 550–700 horsepower with a rev limit of 12,000 RPM and runs on E85 fuel. Chevrolet will next compete in IZOD IndyCar Series next weekend at Barber Motorsports Park in Birmingham, Ala., on April 1, 2012. Locally, we can’t wait for the Belle Isle Grand Prix in Detroit this summer to see the cars roar up close. ” You Go Chevy, ‘Let The World Know That Chevrolet Is The Car To Buy.